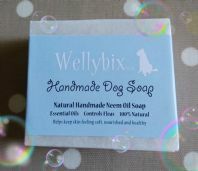 WELLYBIX are healthy dog treats hand-made with LOVE in picturesque Teesdale (North East England) They are full of natural, wholesome goodness and packed with my own garden herbs. 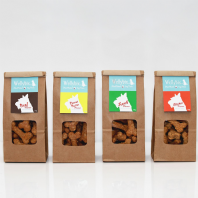 Unlike most commercial dog treats, all the ingredients are of human grade quality and have been tested and approved by WELLY, the Jack Russell! They have NO artifical preservatives, colours, artificial flavour enhancers, added sugar or salt and are analytically tested and approved by a veterinary laboratory. Wellybix are slow baked to sustain their nutritional goodness and flavour. They are hand baked in small batches daily, so you get them fresh every time.